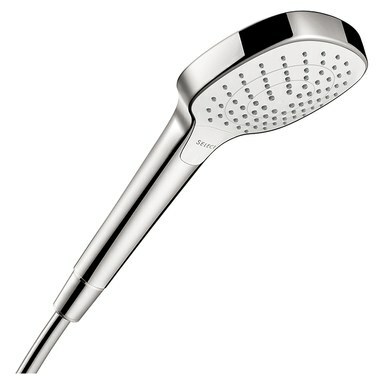 Vary the intensity of your shower experience with this Croma Select E 110 vario-jet handshower. A simple push of a button lets you adjust the force of four spray zones to find the perfect mode to suit your needs. The no-clog design of the 79 spray channels makes clean-up a breeze by preventing calcium and lime deposits from forming. The 4-3/8" handshower face is angled at 65-degrees from the handle to provide a more comfortable grip. Designed for use with any shower hose with standard 1/2" threaded connections. Shower hose and holder are not included and sold separately.